For those of you who have been following the discussion, a Lean Startup is Eric Ries’s description of the intersection of Customer Development, Agile Development and if available, open platforms and open source. 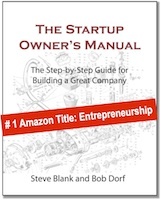 A Lean Startup is not about the total amount of money you may spend over the life of your startup. It is about when in the life of your company you do the spending. 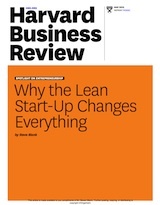 Over its lifetime a Lean Startup may spend less money than a traditional startup. It may end up spending the same amount of money as a traditional startup. And I can even imagine cases where it might burn more cash than a traditional startup. The key contributors to an out-of-control burn rate is 1) hiring a sales force too early, 2) turning on the demand creation activities too early, 3) developing something other than the minimum feature set for first customer ship. Sales people cost money, and when they’re not bringing in revenue, their wandering in the woods is time consuming, cash-draining and demoralizing. Marketing demand creation programs (Search Engine Marketing, Public Relations, Advertising, Lead Generation, Trade Shows, etc.) are all expensive and potentially fatal distractions if done before you have found product/market fit and a repeatable sales model. And most startup code and features end up on the floor as customers never really wanted them. Therefore when money is hard to come by, entrepreneurs (and their investors) look for ways to reduce cash burn rate and increase the chance of finding product/market fit before waste you bunch of money. The Customer Development process (and the Lean Startup) is one way to do that. In Customer Development your goal is not to avoid spending money but to preserve your cash as you search for a repeatable and scalable sales model and then spend like there is no tomorrow when you find one. This is the most important sentence in this post and worth deconstructing. Preserve your cash: When you have unlimited cash (internet bubbles, frothy venture climate,) you can iterate on your mistakes by burning more dollars. When money is tight, when there aren’t dollars to redo mistakes, you look for processes that allow you to minimize waste. The Customer Development process says preserve your cash by not hiring anyone in sales and marketing until the founders turn hypotheses into facts and you have found product/market fit. As you search: Customer Development observes that when you start your company, all you and your business plan have are hypotheses, not facts –and that the founders are the ones who need to get out of the building to turn these hypotheses into customer data. This “get out of the building” activity is the Customer Discovery step of the Customer Development Model. Repeatable: Startups may get orders that come from board members’ customer relationships or heroic, single-shot efforts of the CEO. These are great, but they are not repeatable by a sales organization. What you are searching for is not the one-off revenue hits but rather a repeatable pattern that can be replicated by a sales organization selling off a pricelist or by customers coming to your web site. Scalable: The goal is not to get one customer but many – and to get those customers so each additional customer adds incremental revenue and profit. The test is: If you add one more sales person or spend more marketing dollars, does your sales revenue go up by more than your expenses? Finding out whether you have a repeatable, scalable sales model is the Customer Validation step of Customer Development. This is the most important phase in customer development. Have you learned how to sell your product to a target customer? Can you do this without running out of money? Scale like there is no tomorrow The goal of an investor-backed startup is not to build a lifestyle business. The goal is to reach venture-scale (~10x return on investment.) When you and your board agree you’ve found a repeatable and scalable sales model (i.e. have product/market fit,) then you invest the dollars to create end user demand and drive those customers into your sales channel. If you confuse Lean with Cheap when you do find a repeatable and scalable sales model, you will starve your company for resources needed to scale. Customer Development (and Lean) is about continuous customer contact/iteration to find the right time for execution. How to raise real money with a Customer Development presentation in the next post. Great post. 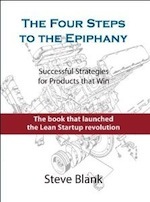 All of this is hit upon in your book but reframing and coming back to the concepts via this blog will definitely help with clarifying the ideas and processes behind Lean Startups. This is a common misunderstanding and one that bootstrappers trip over. The time to seek funding is after you have successfully passed customer validation and have a scalable repeatable model. You can continue to grow the business based on organic cash flow or you now can develop a business plan that deserves investment based on observed outcomes (“facts”). Which seems to offer an understanding of “customer development” that’s quite different the Four Steps to the Epiphany approach. The Customer Development Model is designed to minimize the risk of launching a product for a market that does not exist. It encourages a startup to invest in customer discovery and validation in parallel with product development prior to product launch. Lowering/increasing the cost of engineering personnel doesn’t affect this model (although the trend over the last two decades has been to dramatically lower the cost of developing a software product: open source libraries, Moore’s Law, Internet distribution/SaaS are three big drivers). As your diagram makes clear: there is no point in suspending your efforts to validate product/market fit in favor of “launching” unless you have evidence of demand and a repeatable scalable process for creating customers. Great post Steve — this puts a great framework around what I’ve been thinking through with my current startup. I think your definition of hitting a “repeatable and scalable sales model” also answers the question for a lot of people about “when” to take VC money. I see a lot of early-stage entrepreneurs waste too much time chasing money rather than figuring this out first. It seems like businesses who focus on finding their repeatable and scalable sales model first get to revenue more quickly and the funding conversation becomes much easier. I have to agree with Steve and an earlier comment from Andrew — I too have been looking for the definition of the state of my current startup and the few words “repeatable and scalable sales model,” and the frameworks you describe really glue it all together for me. A startup’s role is to discover what customers want/need, then tweak and tune their product and sales models to create an effecient process to signup more customers (thus scale).